Granite Peak Publications, 9780985818272, 400pp. 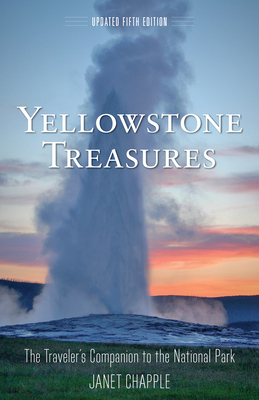 This fifth edition of the popular guide to Yellowstone, the world's first national park, revises descriptions of the hot springs, geysers, and wildlife viewing spots. Mile-by-mile road logs document every approach to the park and every interior road. Through charts and explanations, readers learn of Yellowstone's campgrounds and facilities, geyser basins and the frequency of the geyser eruptions, and out-of-the-way hikes. Updates include descriptions of new lodgings, scientific information reflecting recent research, 65 new color photos, and revised maps. A field guide to the animals and plants, a selected reading list, and a 21-page index round out this comprehensive guidebook. Janet Chapple is a Montana native whose parents once worked at Old Faithful Inn, the historic lodge in Yellowstone Park. She is the editor of the historical anthology Through Early Yellowstone (2016) and cotranslator of the English edition of Yellowstone, Land of Wonders (2013), an 1883 travelog by Belgian travel writer Jules Leclercq. She lives in Oakland, California.